Electrical power consumption is exceptionally low at less than 1.9KWH/M3/day for 25 degrees Celsius and < 36,000 ppm seawater . SWRO power consumption, excluding feed water pump and distribution pump power consumption. 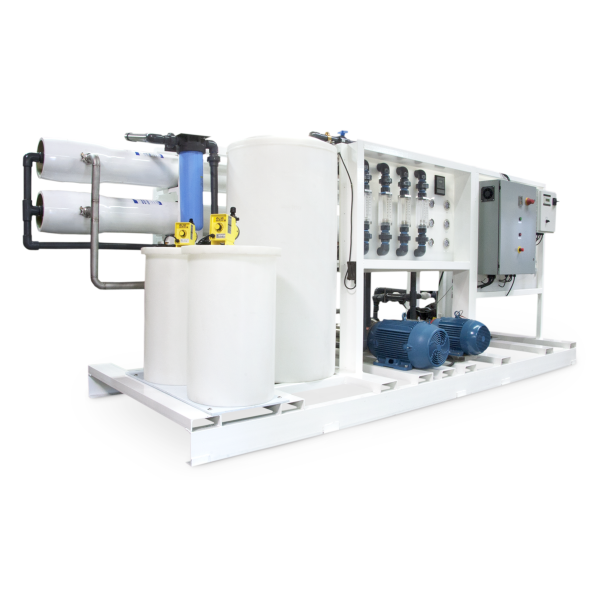 ForeverPure Seawater RO systems are designed to operate under high or low TDS conditions. The built-in Variable Frequency Drive (VFD) can be adjusted to increase or lower the operation pressure according to feed water TDS. The VFD feature coupled with Energy Recovery System greatly improves the system efficiency and lowers electrical consumption. In today’s high energy cost world, these are essential features to have in a seawater desalination plant. Pre-Filtration System: corrosion resistant fiberglass/PVC housing, 5-micron cartridge type sediment filter further reduces suspended solids in the feed water stream to RO system. It protects the RO high-pressure pump and lead end RO membrane elements from debris. 100 gpm rating. 2 No. Membrane Housing: Codeline/Protec/Wavecyber fiberglass housing, 8" diameter, holds 4 membranes, 1000 psi rated pressure vessel, 4 No. Membranes: Energy Saving, seawater desalination membranes, 16 No. 8"x40"
One metering injection systems will be supplied for controlling different elements in the feed water of the RO plant. The metering pump will allow controlling of different functions such as the stroke length and percentage rate. The Biocide Dosing System reduces bio-fouling potential in the RO system. A multimedia filter is designed to make better use if the bed depth in the removal of a greater volume of suspended solids. This is achieved by loading larger media granules of lower density at the top of the bed, with at least one layer of smaller media granules of higher density below it. The larger granules remove the larger suspended particles, leaving the smaller particles to be filtered by the finer media. Three depth multi-media filtration system is used to filter sand and sediment (turbidity) down to approximately 20 Microns. Automatically backwashes when clogged. Saves replacement filter cost. Filter size is 48"x72" , with high performance composite & fiberglass tank. 3 .No. One metering injection system will be supplied for controlling different elements in the product water of the RO plant. The metering pump will allow controlling of different functions such as the stroke length and percentage rate. The Chlorine Dosing System sterilizes product water. A ORP controller is included to monitor the chlorination level. One metering injection system will be supplied for controlling different elements in the product water of the RO plant. The metering pump will allow the control of different functions such as the stroke length and percentage rate. The pH adjustment system adjusts product water pH by injecting caustics into the product water to raise product water pH. Includes high flow pump, 316 SS, heater. It cleans membranes and can be used to sanitize the membrane system. If the product water TDS rises above a preset value, then the system will trigger an alarm and divert the unqualified product water into the drain. This function ensures product water quality. Complete insulation of the container. Second side door to enter container. Paint white rust inhibitive paint inside and outside.